A small but beautiful playhouse such as this one can still bring a lot of pleasure to the small and beautiful people in your life. 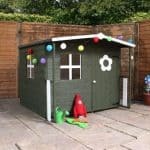 It’s very attractive, especially when painted in colours chosen by your children or grandchildren, and it can fit lots of toys and games inside or simply act as a place for the young ones to indulge their imaginations. It has a compact design, but that means that it’s ideal for gardens where space is at a premium, and it offers excellent value for money as well. The well proportioned door features a round window in the centre of its upper portion, which forms the middle of a fun flower design. Children will really enjoy looking out of it, but what we like most about it is that it’s made with tough and shatter resistant styrene glazing. The same is true of the other three fixed windows, and it’s good to know that the building as a whole is very safe as shown by its EN71 mark. A playhouse makes a great little play area if it’s raining outside, and thanks to the felt clad apex roof and interlocking shiplap cladding there’s no chance of rain reaching the interior. This is one of the smaller playhouses that we’ve reviewed, but that’s part of its charm. It means that people who have smaller gardens can now have a purpose built area for their children or grandchildren to play in, and it’s highly affordable too. At the top is an apex roof with an attractive waved decoration that children will love. 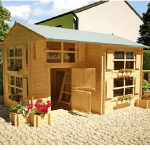 It gives a ridge height of 1.38m and an eaves height of 0.92m, and the overall width of the playhouse is 1.20m with an overall depth of 1.14m. The dimensions above won’t take up much of your garden but they still provide enough space for two children aged three and upwards to enjoy. The great thing about a playhouse like this is that it allows the youngsters to use their imagination to turn it into anything they want, be it a spaceship or a fairytale castle, and of course it gets them away from the television or tablet. 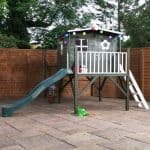 We were pleased to see that even though this is a small and affordable playhouse, that doesn’t mean that the manufacturer has compromised when it comes to the quality of cladding used. 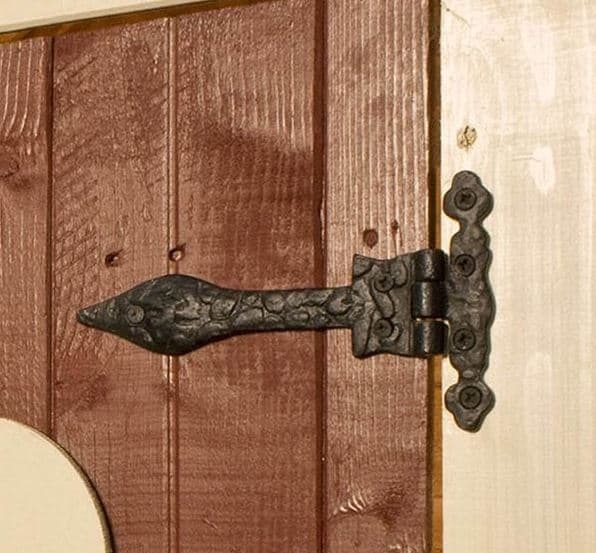 The walls are made of tongue and groove cladding with a thickness of 12mm. 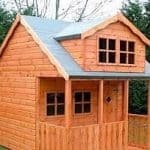 This is a thick and tough as the cladding we see on much more expensive playhouses we review, and the 28 X 28mm framing is also the same and creates a strong and stable structure. The floor is thinner at 8mm and made of solid sheet material. We would have liked to see a slightly thicker floor, but this is still strong enough for its purpose. Whilst the manufacturer has used a basic dip treatment of preservative, as opposed to longer lasting treatments, we can understand why they’ve done that to keep initial costs down. This means that the customer is expected to add their own treatment almost immediately after installation and then on a yearly basis afterwards. On a positive note, however, thanks to its size it won’t take long to treat this playhouse and it’s also good to see that a free tub of basecoat is provided to help with this initial treatment. One other result of the dip treatment is that there is no extended warranty period, with only the statutory one year guarantee provided. 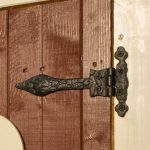 With a width of 0.55m and a height of 0.90m, the door is as accommodating as most that we see on similar playhouses, and it also features a round window that forms the centre of a flower with wooden petals around it. When the sun shines on it and gives it a golden glow this becomes especially noticeable and attractive. 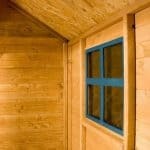 There are also three other fixed windows, so sunlight can get inside at any time of day. The thing we liked most about these well sized windows is that they feature styrene rather than glass; it’s a clear plastic and very tough and shatter resistant. The EN71 mark shows that a playhouse meets stringent safety standards, so we were pleased to see it here and we’re sure you will be too. The tough and safe glass mentioned above is another welcome feature, and because this building is situated on the ground, rather than on a raised platform like some that we see, there’s no need to worry about potential hazards caused by heights. One threat to timber floors on either sheds or playhouses is rising ground moisture, which is why we were pleased to see that there is an option to add a base kit to elevate the floor above the ground. There’s also an option to have this base kit professionally installed, although at £69.99 we suspect that most will choose to install it themselves. 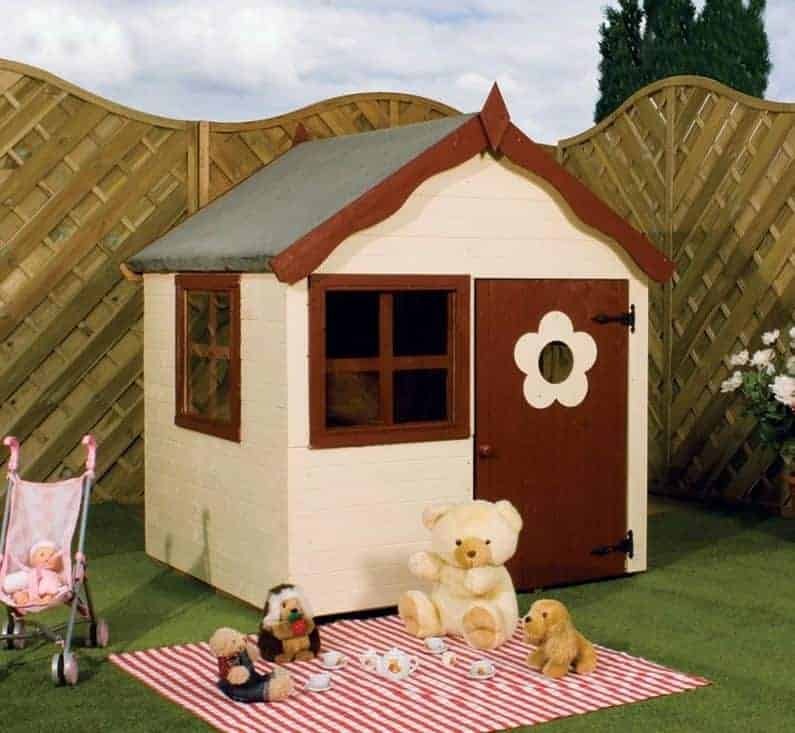 The professional installation service for the playhouse itself, at £109.99, represents better value and could be popular with people whose time is at a premium. Other extras available are tubs of woodstain, and we always recommend that bare timber is painted to give it long lasting protection against the sun. On a more fun note, there’s also the chance to buy a skittles game or a twister like game that all the family will enjoy. 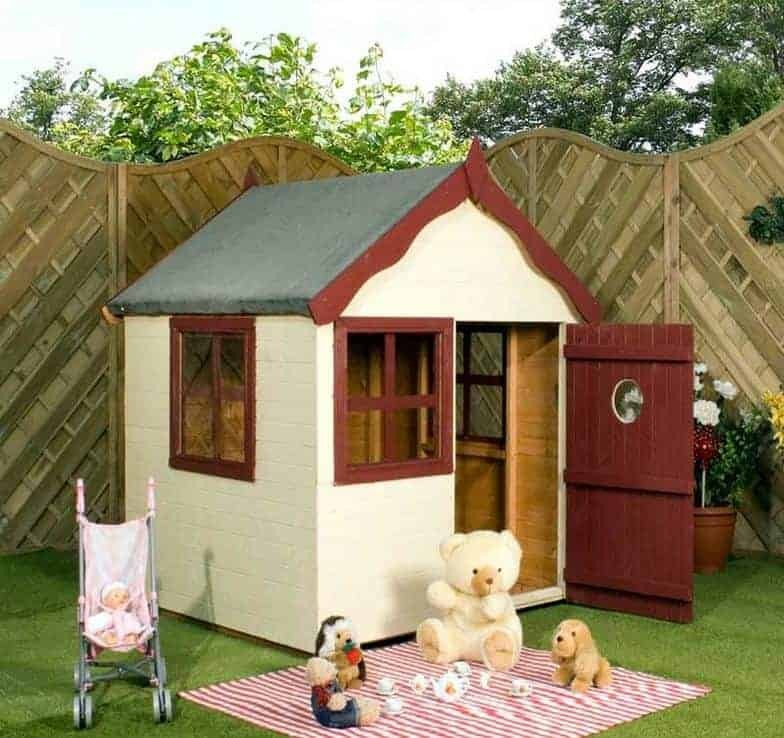 At this price we were impressed by the quality shown throughout this playhouse, as represented by the use of thick tongue and groove cladding. This doesn’t have the inbuilt longevity that a pressure treatment would have given it, so it’s essential to keep up the treatment schedule. 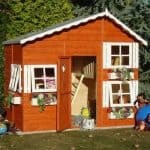 This is a compact playhouse, and will fit perfectly into a small or narrow garden area. As you’d expect with a playhouse as compact as this, it’s very easy to assemble. With a friend’s help, you can complete the installation in between two and four hours. This represents good value for money, and for well under two hundred pounds you can give your children or grandchildren a playhouse they’ll treasure. 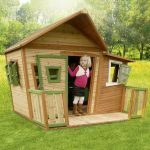 Final Thoughts: We feel that the compact nature of this playhouse makes it a very attractive proposition for those who have a limited amount of space in their garden. Children will love spending time in here, whether they’re having a tea party with their favourite soft toys or playing Get Knotted, one of the games that can be bought as an optional extra. We were pleased to see that high quality tongue and groove cladding has been used for the walls, and once painted this will look very attractive. It won’t be just your children or grandchildren who love it, you’ll also have a good looking new garden feature.